This article is about the town in Mpumalanga. For other uses, see Middelburg (disambiguation). 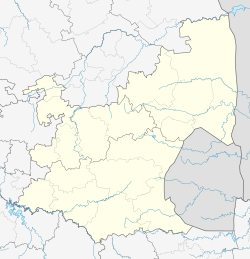 Middelburg is a large farming and industrial town in the South African province of Mpumalanga. Middelburg was established as Nasareth, (root from dry land), in 1864 by the Voortrekkers on the banks of the Klein Olifants River. 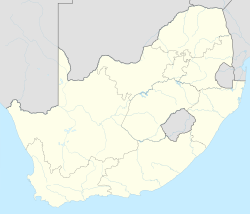 The name was changed in 1872 to Middelburg to mark its location between the Transvaal capital Pretoria, and the gold mining town of Lydenburg. A Dutch Reformed Church was built in 1890 and became a focal point in the area. The British built a large concentration camp in Middelburg during the Second Boer War. The Memorial Museum was built at the site next to the 1,381 graves of women and children that died in the concentration camp. Columbus Stainless, a large stainless steel plant, constructed in 1965, and Thos Begbie & Co, a company established in 1887 by Scotsman Thomas Begbie, are both situated here. For many years, the industrial activities of the steel plant and its peripheral activities, such as coal and transport, provided much of the employment and largely drove the economy of the town, although other sectors, such as agriculture, have gradually grown to be important. Hundreds of expatriates and their families, mostly from the United Kingdom and parts of Europe, moved into the town in the 1950s, 1960s and 1970s to avoid the slump of the post-World War II industrial and manufacturing sectors in those countries. These families were attracted by the need for industrial expertise in the plant, and were often rewarded with company sponsored housing and discounted education. The children of those immigrant families have either moved to the larger nearby cities of Witbank, Pretoria, and Johannesburg, seeking employment, or have remained to form part of the growing alternative economic activities in the area. With a 2016 population of 278 000 and a growth rate of 4.9% the municipal statistical department has estimated that the population will be 500 000 by 2030. The town has one of the largest police forces in the region, a government (public) hospital and clinic, as well as a private hospital, and several public schools. The town is situated conveniently close to one of the main routes to the Kruger National Park, and has a small but growing tourism industry. Some landmarks and notable features in or around the town include the Middelburg Dam, site of the annual Middelburg Mile swimming event , the Botshabelo  mission station museum and associated Ndebele tourist village, several hiking trails, and the Dutch Reformed church in the town centre. A well maintained country club provides facilities for tennis, bowls, a golf course, swimming pools, as well as a bar, hotel, and dining and function rooms. Furthermore, you will find Kees Taljaard Park, which is primarily a rugby stadium, but also has hockey fields. A lot of the local festivals are hosted in this stadium as well. Within the town itself, several popular night spots and family restaurants entertain the locals and visiting tourists. Middelburg Mall was recently built, just off the N4 on the bethal middelburg road and has a wide range of shops and restaurants. Middelburg has a deep Christian origin, for the oldest Dutch Reformed Church is the one mentioned above which is better known as "Die Witkerk." Various bazaars and markets are being held by all churches in support of the community. Examples would be The Expo Art and craft market, which is held annually in the spring by Die Lighuis Gemeente. Corpus Christi also have a world class market which is widely known in the area as the Kersmark. The church community is closely involved in community upliftment and development. ^ a b c d "Main Place Middelburg". Census 2011.